"Jane" was named after her stunning colour that looks like Military Camouflage. She was bred here at Exposed from Dexter and Spot. 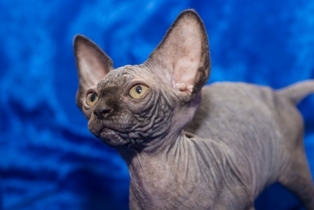 As a kitten recieved sereral titles and won Best Kitten on Show. She has continued to shine on the show bench and we love her look and her personality so could not let her leave. Her Pedigree is also full of special tiltles including National winners as well as Regional winners. "Ziggy" is special and I have waited a very, very long time for a cat like her, she is a Odd Eye Van and her eyes made my heart melt from the moment I saw her. 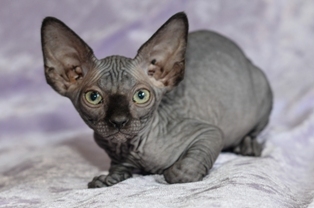 Ziggy is from Jaquiline at muggleborns. "Shadow" is from the first litter sired by Taco, her mom is G I Jane. 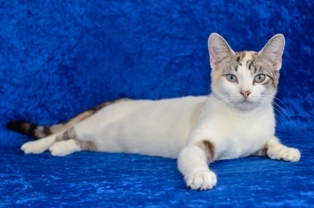 She is very affectionate and loves to cuddle. We are very happy with her development and look forward to stunning babies from her in 2017. "Star" is from Halo who is bred from our original lines and an outcross, her dad is Dexter. She is super cute and we look forward to seeing her develop. "Lulu" is from Ziggy and Max, and it was the first litter for both of them. She is a nice strong girl with a great personality and good features. We expect great things from her! "Twiggy" is from Craig at Swinex, who is a new breeder we are mentoring. This very nice girl has our Stud Max as a Sire. 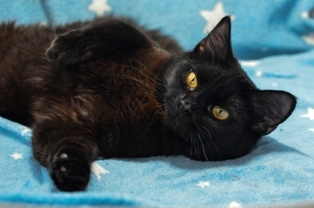 She is very affectionate and always looking for a cuddle. She should give us a nice mix of colours, including some solids. "Ninja" is from Shadows first litter. She is very friendly and active, full of mischief. She has many of our lines in her pedigree and we very happy to have here stay here at Exposed and looking forward to some solid Black and Blue babies from her as well as bicolours and possibly Chocolate too, time will tell. "Jazz" is from our Hybrid Fudge and her Dad is Max. She has many of or older lines as well as a new hybrid line to ensure health and vitality. She is a very exciting kitten for us and was , Best All Breeds Kitten on Show and Judges best at her first show, going on to win overall Cat of the Day in Both the OSRGB and SACATS show in one weekend. 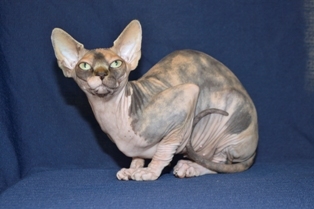 SInce then she has finaled in several Shows with another Cat of the day as well as being the 2nd placed Kitten and 3rd place overall at SA top Cat 2017. "Fudge" is a first generation outcross (F1). 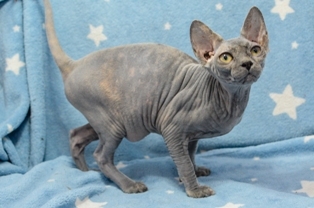 Her mother is a Sphynx (Exposed G.I. 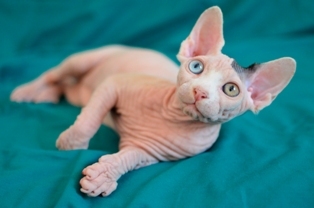 Jane) and her father is a Domestic cat. 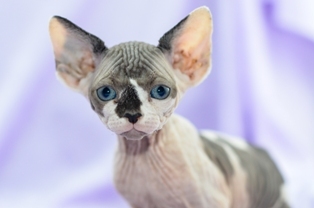 When bred to a Sphynx male her kittens will have a 50% chance of being hairless or 50% chance of being coated, depending which Gene they inherit from her. She is also a very unique colour so we look forward to seeing what she produces as she adds type, health and vitality to our lines. 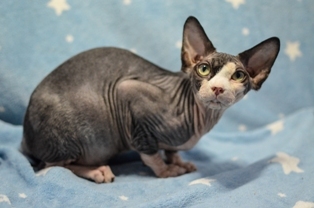 "Lizzy" is an Outcross female from Mugglesborn. 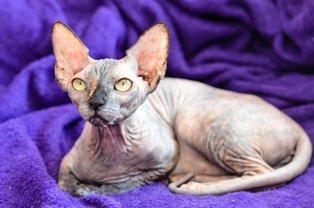 "Outcross" meaning her Father is a Sphynx but her mother is a coated cat. 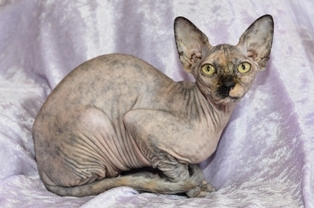 She is a carrier of the hairless gene and when mated to a Sphynx male, she will pass it on to half her kittens. Lizzy also carries the chocolate so we hope to see some more chocolate coloured babies in our lines soon.